Dolphin Browser, a popular third-party web client for Android (s goog) devices, is set to get even more popular. On Tuesday, the browser gained two new add-ons, supporting both Skitch and Evernote. The Dolphin Browser is relatively unique on mobile devices because such browser extensions are easily added and integrated. The Skitch add-on brings the ability to draw or make notes on any web content in the browser. 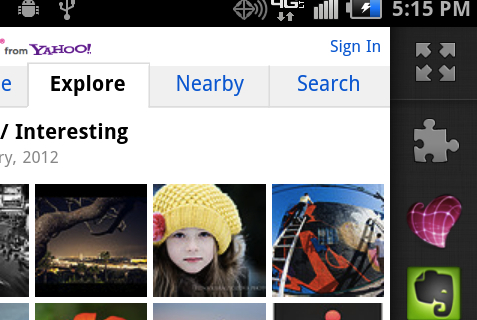 Users will need to install the free Skitch app on their Android phone or tablet for Dolphin Browser support. Skitch is already a handy utility on desktops, but I see the value in adding the app to a mobile browser. Think of annotating images, maps or text from a web page and then sending those to a friend or family member. Evernote was already on my must-have app list due to its support for most desktop and mobile platforms; it gives you a ready-to-use notebook in the cloud for ideas, text, images, links and even audio notes or videos. With the new Evernote add-on for Dolphin Browser, it becomes easier to capture and save such digital objects. As more people browse the web on mobile devices, these two add-ons make sense for the Dolphin Browser team. Instead of relying on a dedicated app to capture or store ideas — Evernote has a mobile app, for example — you can now browse the web and easily save text, links or media seamlessly among such apps. Nearly a year ago, I provided 8 reasons for Android owners to try the Dolphin Browser. With Tuesday’s news, that list just increased to 10 reasons. Screens with a Droid Charge! The ugly brown color scheme. Its okay. I have one too. Prefer Catch over Evernote (okay, I’m in the minority). Catch has long been a note option in Dolphin.